I wasn’t sure what to do with this yarn, but I knew I wanted to show it off. 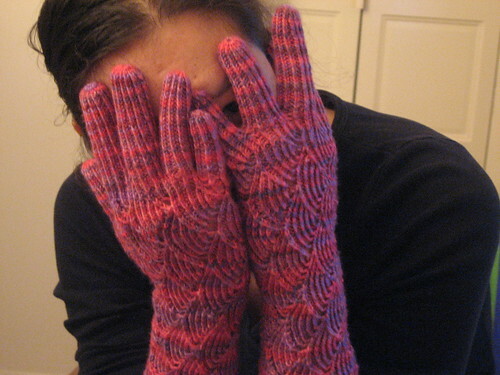 So, I made gloves. 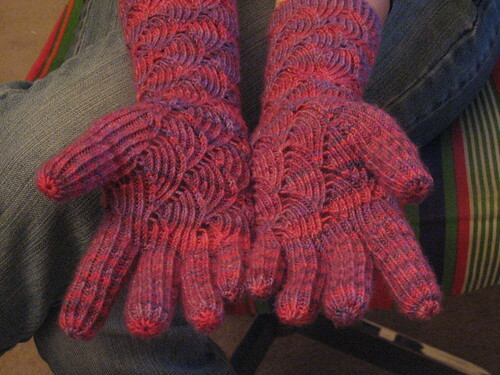 Generally they’re good gloves, though the pattern is a little weird: the thumbs appear to have tumors on the sides. I altered that somewhat, to good effect. 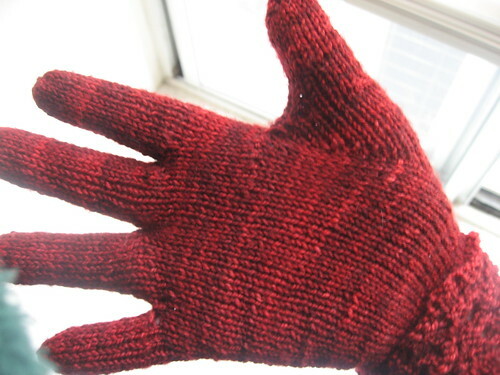 (thumb tumor)They are warm and soft and red, which is really what I require of gloves. They aren’t as tight as my mermaid gloves, either. In preparation for NaKniSweMo, when I will be (mostly) faithful to one project, I have been frantically churning out small projects. 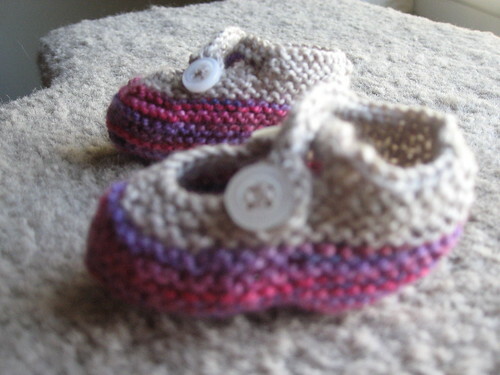 Here’s one: Saartje’s bootees, for a friend of mine’s niece. I don’t have children, and I don’t ever intend on having any, but I couldn’t resist the call of such an easy, quick, cute knit. This pair really did only take hours. 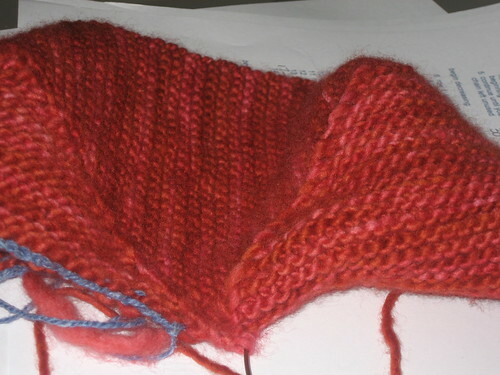 I’ve already started a second, slightly larger pair in solid Koigu. I have one of the two done, but have been distracted by zeebee. I’ve been looking for something to use my Malabrigo on, and this is perfect. Nevermind that it’s already sort of starting to pill, before I’ve even finished making it. It’s soft, and squishy, and red! I will be a very exciting sight when I wear both that hat, and my bright pink/purple gloves. Yes indeed. These are awesome, in my opinion. Pattern: based on the Knitty pattern Pomatomus , heavily modified. Yarn: Sweet Georgia superwash sock, Kiki, 2ish skeins. I’m addicted to podcasts. 2/3 of them are knitting podcasts, but I also listen to a Harry Potter podcast (Mugglecast), This American Life, and The Savage Love podcast. Days that none of these podcasts are new are very sad days for me. This Monday, I woke up to discover that I was out of stored up podcasts, and went on a search for another knitting podcast to hold me over until my regulars updated. I discovered Sticks & String, a podcast recorded by an Australian guy. It’s really good! I’m always amazed to find new and exciting podcasts. 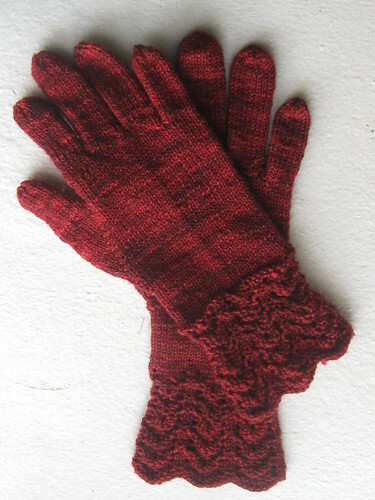 In other news, I’m gearing up for my winter knitting, and I have Decided (capital D) that I will finally make gloves for myself to wear. I have the perfect yarn. It’s Sweet Georgia sock yarn that is far too pretty to make into socks (and it appears to be resisting being turned into socks, too), and the pinks go perfectly with my brand new navy wool winter coat. So. The ravelry search begins. Last year I attempted to make gloves, and failed miserably, mostly because I couldn’t really find a pattern that I liked, and I’m lazy and got tired of making glove fingers. This year I will prevail. And it’s the sort of project that I can make while also making Christmas socks. You’ll see.